– Local officials should soon have a new tool to address misconduct or corruption on local volunteer boards and commissions. State Representative Brad Halbrook led unanimous House approval of legislation he authored to allow those who appoint members to volunteer boards to also remove them if actions warrant. “Misconduct doesn’t solely impact elected bodies. Members appointed to volunteer boards can also exhibit bad behavior that warrants their removal. This simply allows local officials who appoint members to these volunteer boards to also remove them for misconduct or corruption,” said Representative Halbrook (R-Shelbyville). Currently, County and Municipal officials have the authority to remove members of local 9-1-1 boards that they appoint. House Bill 3148 will extend that removal authority to all volunteer boards to which they appoint members. 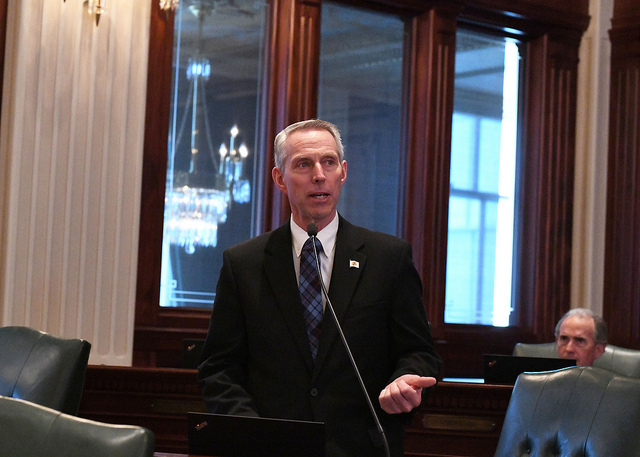 “This is simply another tool we can use to make sure those working for us at all levels of government are truly looking out for our best interests…not their own,” Representative Halbrook said. Representative Halbrook noted that the change was suggested by a local good government group. It now advances to the Senate for concurrence, where he expects it to receive more strong support.